Cyso Review 2019: Is Cyso a Good Hosting? Cyso is a managed hosting provider for large businesses and corporations. Based in the Netherlands, Cyso serves over 2000 customers worldwide. 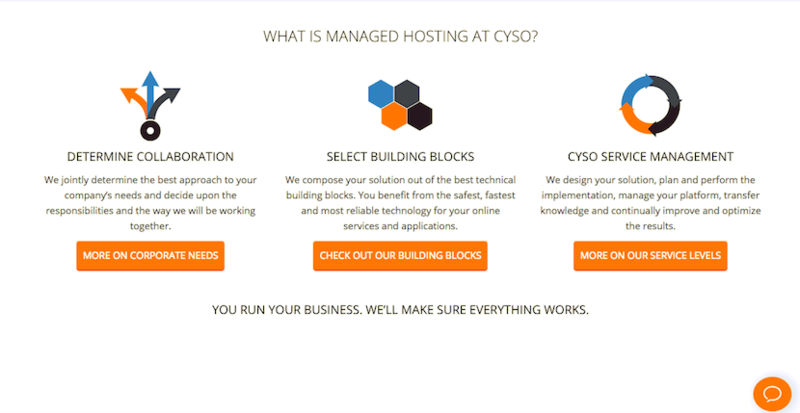 Founded in 1997, Cyso is a managed hosting provider located in the Netherlands. They are a large provider with over 2000 customers, 3 data centers, and 50 employees. Their website is available in Dutch and English, and they serve customers worldwide. Cyso specializes in designing, building and managing business hosting solutions for complex platforms and applications. Their services are aimed at businesses who want to outsource the day-to-day management and maintenance of their servers to Cyso. They do not provide shared hosting for small business or websites. I really like Cyso’s higher security package, Mission Critical Hosting, which gives you additional support on top of their regular managed hosting plan. It is for large businesses that require optimum security and cannot afford any website downtime or reduction in website performance. Mission Critical customers enjoy a better uptime SLA (99.9%) than the managed package, a dedicated account manager, and an operational focus on performance and security. On this plan, you can leave it to Cyso to conduct security audits and implement the recommendations. The other really great way Cyso adds value is with their extra support and outsourcing options. For example, they provide technical support to improve an application’s performance. They also have a 24/7 outsourced I.T. team to help with your businesses technical requirements. One downside to Cyso is their website. Whilst it looks very professional and appears to include a lot of detailed information, I found it quite confusing. It was hard to understand their exact services, and they did not include any pricing, which was inconvenient. To get a custom quote required several messages on live chat even to speak with an operator. Unfortunately, Cyso pricing is not very transparent. They do not include pricing plans or billing terms on their website. In order to get a quote, I needed to contact sales to discuss my requirements in detail. They then designed a bespoke plan and price for my needs. Whilst I appreciate the attention to detail and the consideration of my specific business goals, I would ideally like to see at least a ballpark price on their website before spending time on getting a concrete quote. However, the quote was reasonable and in line with local competitors. Cyso offers plenty of customer service options: email, phone, live chat, Facebook, Twitter, Linkedin and even in person. For non-emergencies, their service desk is open from Monday to Friday, 08.30 to 18.00 (Dutch time). Out of hours, they direct you through to an emergency team to deal with your inquiry. Whilst the provision of support sounds comprehensive, Cyso can be slow to pick up messages on live chat, and their English support could be improved. I messaged several times a day during their open hours and did not get a response. When I did chat with an operator, I felt the help could have been more in-depth and… helpful. For large businesses that require premium website hosting with outsourced management, Cyso offers lots of options. Their services cater to corporations that are less concerned with budget-friendly options, and which require a fully outsourced, managed hosting plan. Wondering how Cyso stacks up against other Web Hosting companies? Enter any other Web Hosting company and we will give you a side-by-side comparison.